There was a time when supercars were very difficult to drive on US roads. A measly 55 mph doesn’t sit well with V10’s, V12’s or even some supercharged or turbocharged V6 and V8’s. Although the speed limit has been raised above 55, a true supercar needs to be running over 100 mph, then all the engine and suspension technology kicks in to give you the ride you’re looking for. Unfortunately, on the streets, this kind of enjoyment is not possible (or legal). Fast forward to today and the supercar has got street creds at any speed. A perfect example is the 2018 Lamborghini Huracan Performante. This top of the line supercar is at the top of its game: it’s got looks, style, speed and yes – safety. And to prove it, I was invited to Thermal Raceway (at 61980 Tyler St. Thermal, CA 92274, which is a private raceway club, just in case you want to join) for a spirited run around this amazing road course at max speed. Here, 100 mph is not only allowed, it’s encouraged! To set the stage, the Performante is powered by a V10 engine producing 630 horsepower, backed by a LDF 7-speed dual-clutch transmission that allowed a professional driver to travel the infamous ¼ mile in 10.4 seconds and hit 135 mph on the Nurburgring, navigating the track in a record-setting 6 minutes and 52.1 seconds for production cars. 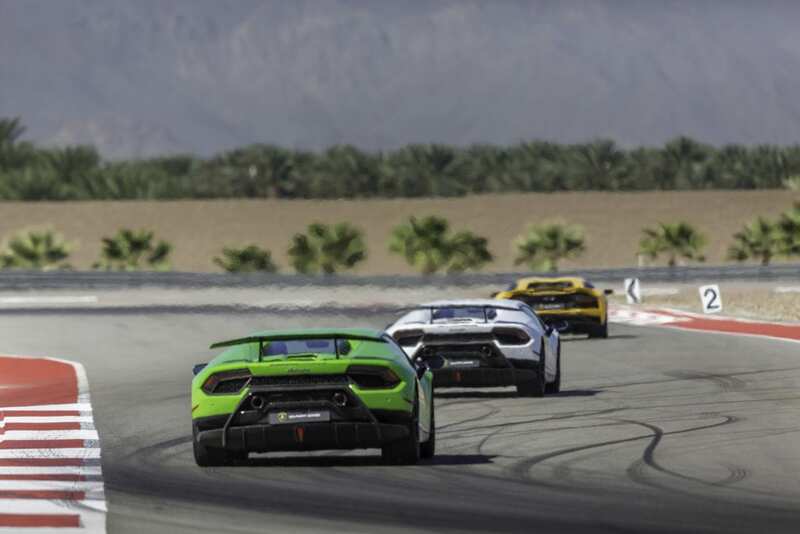 Lamborghini’s R & D boss Maurizio Reggiani calls this a 360-degree approach to performance. This means more power, less weight, suspension improvement, and the addition of more aerodynamics. 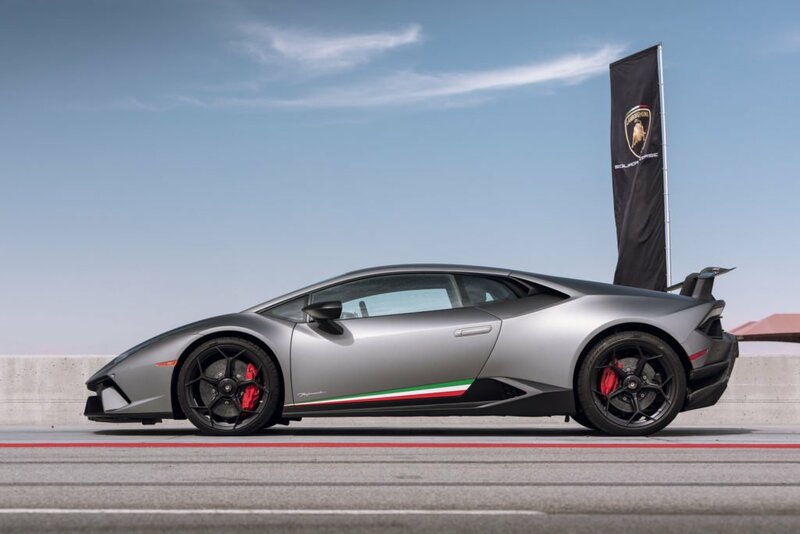 What makes the Huracan Performante rise a grade above the base Huracan are little touches like Titanium intake valves, hotter intake camshafts, and free flowing exhaust with an amazing sound quality. Not only does the exhaust enhance the driving experience with the sweet resonation, it also boosts horsepower by 30 over the stock Huracan. The Performante revs lower by 25 rpm’s. Peak torque is increased from 30 lb-ft to 443 at an unchanged 6500 rpm, which creates a smoother power curve above 4,000 rpm. The Performante lost about 90 pounds thanks to the addition of a lot of weight-saving carbon fiber parts and pieces. Actually Lamborghini has developed their own carbon fiber quite simply called Forged Composite technology, that looks like water flowing versus little squares. 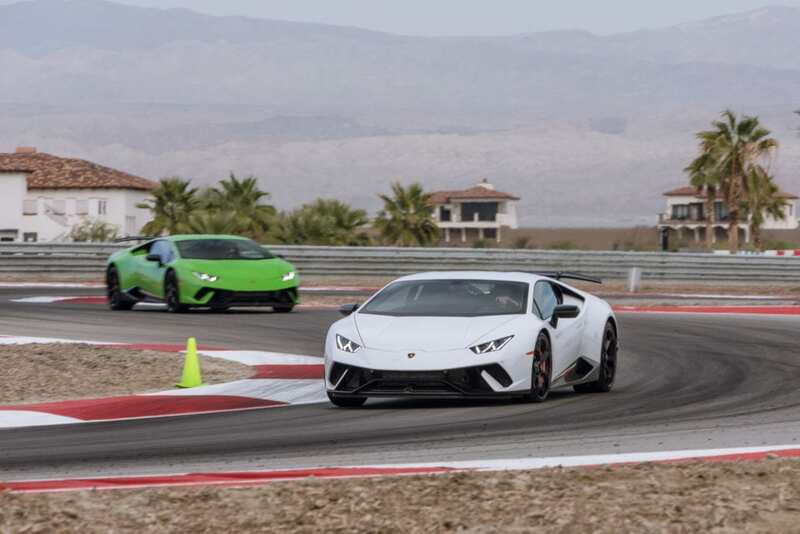 Of course the chassis had to be reinforced to match the thrust, so Lamborghini gave the Huracan 10% stiffer springs and thicker sway bars with 15% increase in roll stiffness. The Lamborghini also gets an aerodynamic system called ALA which stands for Aerodinamica Lamborghini Attiva. This system comes with a front spoiler and a wing in the rear that produces 770 pounds of down-force at 193 mph. At high speeds, the rear wing will keep the Huracan from literally taking off and becoming airborne. Motorized flaps up front add to the downforce by pushing air over the top of the wing or into the hollow rear wing. The Performante has three driving modes, Strada (street), Sport and Corsa (track/racing) mode. As we mentioned, the V10 engine is backed by a very smooth LDF 7-speed dual-clutch transmission which handles the power with ease and massive steering column mounted (not steering wheel) paddle shifters that are easy to use, even in a turn. The interior is fighter-pilot inspired, although your eyes may never leave the speedometer. Getting set to drive the Thermal race track was pretty simple and once the car reached operating temperature the carbon ceramic brakes did their job. Reaching redline was rather quick until you became one with the Performante then the fun begins. It was the best time ever driving the Lamborghini Huracan Performante and charging around Thermal at track speed was a dream come true. But how does it drive on the street? To answer my question, Lamborghini sent me a beautiful white Performante with the Italian flag colors of red and green smartly placed at the bottom of the doors. This car was a growler when started up first thing in the morning thanks to its amazing free-flowing exhaust. The Performante has one great feature that you would think is exclusive to low-riders: The front end raises and lowers. This allows the driver to pass over speed bumps and park the car without damage to the trim. The Pirelli P Zero tires did exactly what they were designed to do, and that is stick! If there was a negative, it is the limited adjustment options for the driver’s seat. The issue with the seat was not enough to dim my enthusiasm, as the Performante is truly a driver’s car and whether you take it out for a Sunday drive or to track day, it will satisfy the best and worst driver out there. Is it worth the starting price of $274,390? Without a doubt! This is the kind of car you make sacrifices to own. Major sacrifices. However, the privilege of ownership comes with a caveat. Don’t be stingy and keep it garaged in your collection! This is a car that needs and wants to be driven! Let ‘er loose.